Check out these music tools. Links and a brief description are provided. Patatap | A free jamming and beat making tool. Theremin | A free touch friendly synthesizer which works great as a dub siren. WAVE-PD1 | Another touch friendly virtual instrument. Tibersynth | Make totally weird noises and swooshes with your mouse. WebModular | Play a modular synthesizer in your web browser. TrueGrid | A complex modular synthesizer with patch saving and audio export. Tanguy | Virtual analogue synthesizer capable of processing external audio. Patchwork | An awesome experimental modular synthesizer. Build your synth from scratch. AngryOctopus | A collection of web-based virtual instruments (requires Java). PatternSketch | Cool grid based sequencer with several kits and export functionality. Tonematrix | A simple tone matrix from the makers of Audiotool. Otomata | Another matrix sequencer for jamming and inspiration. PulseBoy | Free Game Boy style tracker. Seaquence | A totally weird generative music sequencer. SiON FM Synthesizer WF-1 | Neat FM synthesizer with a mouse controlled filter. WebSID | Browser based Commodore 64 style synthesizer. MiniGoog | A Minimoog Google Doodle in celebration of Robert Moog's 78th birthday. Sample-stitch | Re-create iconic hip hop tunes with your computer keyboard. Musical Keyboard | A really simple online piano keyboard. WebAudio Drum Machine | Online drum sequencer with several kits and effects. FL 909 | Free Roland TR-909 emulation. 808 | A simple Roland TR-808 kit for online jamming. Sequence | Free drum pattern generator with over 100 free drum samples. Monkey Machine | A simple free drum machine from the creator of MauSynth. Qwerty Beats | Online drum machine with a freaky mouse controlled synth. JS-909 | Web based drum machine (requires QuickTime). Drum Kit | You, your computer keyboard and 26 weird samples. Bfxr | Creates 8-bit sound effects which you can download in WAV format. Text to Speech | Convert any text to speech and download the result as an MP3 file. Online Tone Generator | A handy test tone generator. Sweep Sine Tone | Sweep tone generator for testing your monitors and room acoustics. Noisli | A wonderful background noise generator to help you relax and focus. Defonic | Another free noise generator to help you relax. Audiotool | A modular online music studio with a set of virtual synthesizers and effects. AudioSauna | Free online workstation for making music on the go. Soundation Studio | Online sequencer with audio and MIDI processing. TwistedWave Online – A free online audio editor for editing mono audio files. Studio One Free | Free edition of Studio One, no VST support. Podium Free | VST plugin support, limited to a single CPU core. Splice | Online platform for music creation and sharing. Indaba Music | Free online music collaboration platform. Ohm Studio | The first free online collaboration platform for musicians. Blend | Collaborate online and create remixes (powered by Dropbox). Kompoz | Collaborate with musicians from around the world. Livegit | A free online collaborative DAW. JAM with Chrome | Jam with your friends in Google Chrome. Plink | A fun way to pass time and make music with total strangers. EQ Your Ears | Identify specific frequencies with this online tool. EQ Match | Simple graphic EQ trainer. Note Ear Training | Identify notes by ear. Pitchimprover | Absolute pitch training. The Music Intervals Tutor | Recognize music intervals by ear. EarTeach | Various ear training utilities. Blind Listening Tests | Various tools to test your ears. Autochord | Chord progression generator based on key and playing style. Interactive Circle of Fifths | An easy to use online circle of fifths. Interactive Frequency Chart | Interactive frequency chart with an ear sensitivity graph. Metronome Online | Free online metronome and tone generator. Tap for BPM | A free tap tempo tool to calculate BPM. Music Calculator | Convert BPM values, calculate transpose ratios, etc. Tunerr | Free tuner tool which uses the microphone input on your computer. Online Guitar Tuner | A simple online guitar tuner from Fender. Pedalboard.js | Process the line-in of your sound card with four guitar FX pedals. Guitar Tab Creator | An online guitar tab making tool. Noteflight | A powerful music notation platform which runs in the browser. Blank Sheet Music | Create and print blank sheet music for free. 99Sounds | Free sound design label offering free sound effects and instrument samples. Freesound Project | Download thousands of royalty free sounds. A Sound Effect | Over 2 GB of free sound effects and field recordings in a single download. NHF Sample Pack 002 | Over 3 GB of royalty free sounds crafted by Neurohop Forum members. Converse Sample Library | A huge collection of stems and one shot samples, completely royalty-free. Goldbaby | Legendary collection of free drum machine samples. AfroDJMac | Over 100 free instrument racks for Ableton Live. Sonatina Symphonic Orchestra | Free orchestral sample library. NASA Audio Collection | Tons of sounds from NASA space missions. Also available on SoundCloud. Acoustic Drum Samples | Our huge archive of free acoustic drum sample packs. Rekkerd | A huge archive of free patches for virtual instruments. KVR Audio | Database of patches and sound banks submitted by KVR Audio members. AudioBombs | A fresh archive of free synth patches and sound banks. BigTick Zen | Manage and launch all your synth patches from a single plugin. 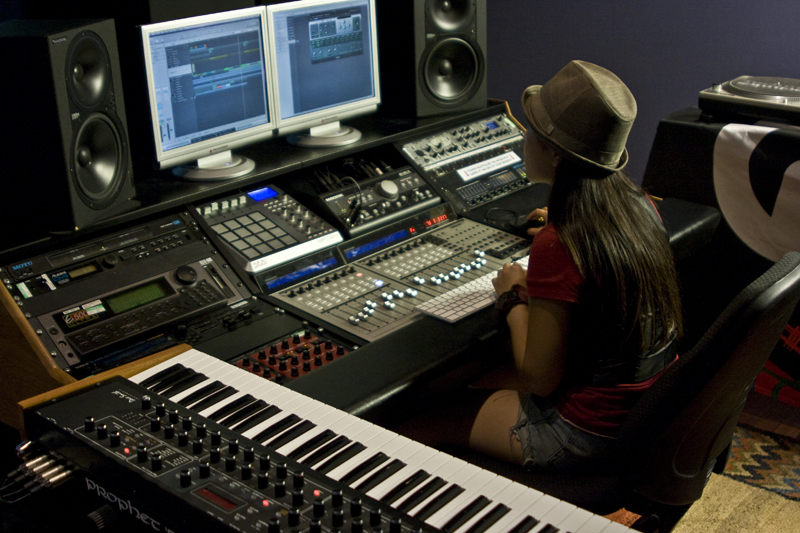 Introduction To Music Production | Free music production course by Berklee College of Music. How To Make Electronic Music | An epic intro to electronic music production. EQ Masterclass | In-depth series of EQ tutorial videos by ADSR. Thinking inside the Box | Great beginner's guide to EQ. Compression 101 | Great beginner's guide to compression. Compress to impress | Compression tutorial for the electronic musician. Kim Lajoie Blog Dump | PDF archive of Kim Lajoie's music production tips. 3 Mixing Secrets From The Legendary Andy Wallace | A reminder to keep it simple. How to Make a Noise | A legendary free eBook guide to synthesizer programming. Synthesis Fundamentals | Free tutorials for absolute beginners by the Bob Moog Foundation. Synth Student | Beginner's guide to subtractive synthesis. Synthesis types | Understand different types of sound synthesis. How To Bass | A series of tutorials for creating heavy bass sounds (by SeamlessR). Syntorial | Software for learning synthesis. First 22 lessons are free. Music Theory for Musicians and Normal People | A lighthearted intro to music theory. Ravenspiral Guide to Music Theory | One of the finest free music theory books (here's the PDF). Music Theory: The TL;DR Version | Music theory guide for EDM producers with short attention spans. Music Theory for Songwriters | A comprehensive guide to music theory for songwriters. 10 Chord Progression Tips | Interesting chord progression tips from a jazz musician. Music Theory Cheat Sheet | A handy TXT file cheat sheet for music theory. A Club Track's Frequency Map | A cool print friendly frequency chart by FutureMusic. EQ tips Cheat Sheet | EQ cheat sheet available for download in PDF format. RealTraps | A guide to testing room acoustics with free software. SoundCloud | The most popular online platform for uploading and sharing your music. Bandcamp | Build your artist profile and share your music with your fans. sfx.io | The Imgur of audio, an quick way to upload and share your music. AudioJungle | The largest online marketplace to sell your music. iStock | Sell royalty free stock music and recordings. Pond5 | Another online marketplace for selling royalty free music. Sampleism | Sell your samples and other sound design work. Wavestack | Backup your recording sessions and share them with collaborators. Dropbox | A great free solution for backing up your files online. Hive | Upload and share your music and other materials. Evernote | Take notes of all your projects and ideas in one place. Trello | A great tool for managing your projects and collaborations. Google Keep | Use this online note saving tool to keep track of your ideas and tasks. Toggl | Time tracking utility to help you stay focused and measure your productivity. Pocket | Easily save online resources (such as this article) for offline reading. Artwork Creator | Create your album artwork for free. CD Cover | Make a simple CD cover with your printer and a bit of paper. Hipster Logo Generator | A free logo generator. Also works for simple album art and covers. Squarespace Logo | Another simple logo generator. Pixlr | Great free online image editor similar to Photoshop. Canva | Incredibly cool free graphics editor to make covers and promo images. Sonic Candle | Completely free tool to generate an HD music video with a spectrum display. Audio Visualizer Creator 2.0v | Free music visualizer generator (requires Adobe After Effects). Blender | Free alternative for After Effects. Loads of tutorials available on YouTube. WordPress.com | A powerful free blogging and blog hosting platform. Strikingly | Build a beautiful looking free portfolio or artist website in minutes. FourFour | Free website platform made specifically for musicians. Flavors.me | Make a free artist website with links to your social media profiles. MailChimp | Build a free mailing list for up to 2000 subscribers. SharedCount | Monitor the social media stats of your releases or artist profiles. Need Help with Propellerhead Reason? Quality instrumentals produced by TaurusBeats combines all elements of the musical spectrum to create the perfect backgrounds for all artists to tell their stories. Instrumentals are available for lease and exclusive rights. Also contact TaurusBeats for instrumentals custom made for your artistic needs. To learn about licensing agreements for beats click the button below.